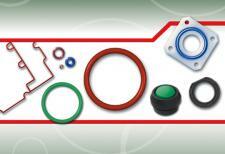 Apple Rubber’s custom medical sealing solutions will meet your exact specifications, no matter the shape or size. From simple seals to the most complex parts, Apple Rubber utilizes a host of sophisticated technologies and processes – including LSR capabilities – to consistently manufacture the high quality components you demand, directly in our USA plant. We offer sealing solutions for applications such as seals for medical appliances, medical pump seals, IV components, feeding devices, implant materials, O-rings for dialysers, and more. Our USA-based manufacturing facility features an ISO Class 7 (10,000) clean room, utilizing the highest quality standards. We deliver in weeks, not months for large and small runs. With parts and seals available in American or metric sizes, complete part traceability and full documentation is standard. Apple Rubber has the experience, the products and the design engineering capabilities to deliver the exact sealing solution for your medical applications. Apple Rubber’s Medical Grade Elastomers are available in all shapes and sizes – and feature improved chemical resistors, excellent heat resistance, and low permeability to gases. From simple seals to the most complex parts, Apple Rubber utilizes a host of sophisticated technologies and processes – including LSR capabilities – to consistently manufacture the high quality components you demand. 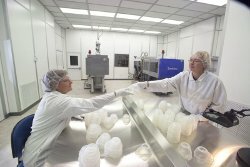 Our cleanroom certification at Apple Rubber Products corporate headquarters in Lancaster, NY reflects our commitment to meeting our customers’ increased demands for cleanroom processing. Air handling system supplying the cleanroom area has recently been certified to ISO 14644-2-2000.09.15 (Testing and Monitoring). This corresponds to FS 209E Class 10,000. Inspection (Gown) Room – Class 7 (10000) in an “As-Built” Mode of Operation at .5 microns. Click HERE to link to Apple Rubber's Inspection Specifications.